With rates for "the death tax" changing each year, family business owners trying to plan for succession are left chasing a moving target. (Fortune Small Business) -- For a tax that each year affects only a few hundred of the nation's 27 million small companies, the estate tax manages to scare an outsize number of entrepreneurs: In a July Zogby poll of small-business owners, nearly half said they believe they will be affected by the fee critics call "the death tax." Prior to President Bush's 2001 tax cuts, the estate tax levied a 55% maximum tax rate on all inherited assets above a $1 million exemption - including business assets passed on by a founder. Bush's cuts set into motion a gradual phase-out of the estate tax; the exemption level has risen and the tax rate has been dropping since 2001, down to a planned 45% rate in 2009 with a $3.5 million exemption. Current law calls for the tax to be repealed for one year in 2010, but without congressional action to either reform the estate tax or make the tax cuts permanent, it will revert back to 2001 levels in 2011. When the next president takes office in January 2009, he will play an integral role in shaping the policy's future. But for those affected, the consequences can be devastating. Brad Eiffert, vice president of family-owned Boone County Lumber in Columbia, Mo., is in the rare category of having a business with enough assets to qualify for the tax, but not enough to pay for it without risking liquidation. Boone County Lumber, begun by Eiffert's father in 1964, brings in $12 million to $15 million in revenues each year; most of the company's assets are in land and equipment. The company carries a $2 million life-insurance policy on its patriarch (for an annual premium of $60,000), but whether that will be enough to cover the eventual tax is impossible to project. Aside from the looming hit of the tax itself, the expenses of planning for it - hefty life insurance costs, accounting and legal fees - take their toll on small companies. "There are those of us out there who are truly affected," Eiffert said. "The very wealthy have the means to avoid this tax." Entrepreneur Caryn Hasslocher, owner of San Antonio catering company Fresh Horizons, is also hoping for clarification as she plans both her estate and that of her parents, the owners of a San Antonio restaurant franchise. They are now in their eighties. "Knowing that the estate tax as it is now is due to expire in 2010 is of a great concern, because none of us know what it will be replaced with," she said. "Overall, we need to get some closure on this one, badly," said Sandy Abalos, a CPA in Phoenix who works with small-business clients. "What we're doing is hanging onto a sunsetting provision, which makes planning really difficult for everybody." Both major-party presidential candidates, Republican John McCain and Democrat Barack Obama, agree on two things: that the estate tax should not revert back to its pre-2001 state, and that it should not be fully repealed. (A permanent repeal would cost $522 billion in lost tax revenue over the next decade, according to the Treasury Department's evaluation of President Bush's 2009 budget proposals.) The candidates also both support indexing the estate tax to accommodate inflation. Talk back: What do you think of the estate tax? 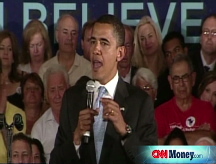 Obama proposes freezing the estate tax at 2009 levels: a 45% tax rate on estates valued at more than $3.5 million. Married couples can combine their exemptions for a total of $7 million. "By exempting all estates under $7 million, Obama's plan will shield all but about 100 estates with small business income from any estate taxation," said Obama campaign spokesman Nick Shapiro, citing the Congressional Budget Office's 2005 study on the estate tax and further analysis by the Center on Budget and Policy Priorities. "Senator Obama's plan would completely exempt 99.7% of estates from taxation." 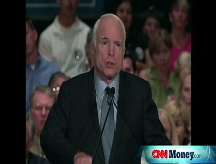 McCain's plan would be a more dramatic departure from current policy. The Arizona Senator favors a 15% tax rate, equal to the capital-gains tax rate, and an individual exemption of $5 million ($10 million for married couples). "The goal is to allow small business to grow and expand," said Doug Holtz-Eakin, a senior policy advisor for McCain's campaign who also served as director of the CBO when its last comprehensive estate-tax study was done. To pay for it, "there's ample room in the spending side to undo the explosion of spending seen in the past eight years," he said. Holtz-Eakin attacked Obama's plan: "His package is one that is simply unappealing to anyone making a payroll and selling a product." Obama spokesman Shapiro fired back, calling McCain's approach a "fiscally irresponsible promise" that would mostly benefit the wealthiest estate owners "without offering any credible way to pay for it." Small-business owners have not moved in lockstep toward either candidate. When Zogby International polled 4,300 small-business owners in July, it found that 46.3% believe their business would do better under a McCain administration, compared to 34.2% for Obama. But when respondents were asked which candidate they planned to vote for, McCain was on top by only half that margin - 46% to Obama's 40%. The uncertainty surrounding the estate tax's changing rates makes planning for it especially tricky. The steps that entrepreneurs can take to avoid the tax vary from situation to situation, and typically require consultation with an expert. A life insurance policy, like the one on Brad Eiffert's father, can pay the tax through its proceeds as long as the policy is separated from the estate in a life-insurance trust. Succession plans, through which the owner's stock is gradually gifted to the next generation, are another option.